0 Comments Published by daveterry on Monday, March 19, 2012 at 11:34 PM. We are winding down our month-long vacation to California. It's been about a year now living in China as expats so it was good to see the fam. 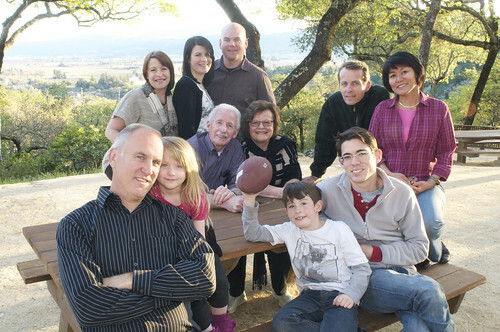 Here in California we've enjoyed the food, wine, cheese, and family fun. But we are looking forward to seeing our friends back in China. We wonder day-to-day what they're up to so it's time to get back in the saddle again. We have Chinese school to join, work to find, and six months of rental money to pay. Yikes! Maybe it would be better just to stay here and live off the folks. I can't think of anything we would have done differently. On this vacation we spent quite a bit of time with the family. We had a family reunion that included games (including a word search of family names), a wild photo booth (complete with crazy costumes), and shared stories. It was great to have all the family in one place so that we could visit together. My cousin even flew up from LA and my uncle drove up from central California. It was a blast. We didn't really go many other places but rather stayed around the house making day trips to the food stores (love Trader Joes), visited some malls (mostly to visit with people), and took a trip to the wine country (Napa Valley). Ruth did fly to Hawaii to see her mom and friends for a week but I didn't get to go. That was tragic. It's always great to be on vacation. You can live simply, see great stuff, and have fun everyday. Why can't non-vacation life be this way? Note to self: Make each day feel like a vacation. Vacations are what you take when you can't take what you've been taking.